Car Valeting Glasgow by GleamGenie provide hassle free mobile car valet and cleaning services direct to you. Our specially equipped vans will come to your work, home, gym, golf club at a time that suits you. All our vans are specially equipped containing our own water and power supply. Covering all of Glasgow, Glasgow City Centre and surrounding areas. We carry out all our car valeting and cleaning services by hand, although we also carry out professional paint renovation, ask for more details. GleamGenie provide top class mobile car valeting service at a time and place that’s convenient to you. We offer a fully customizable valet on your vehicle, the prices on this site are a guide to our most popular car valet services. We provide a full range of car valeting and cleaning services on any type of vehicle regardless of make, model, size and condition and can remove most stains, spillages etc. 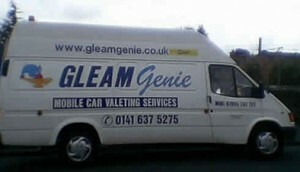 GleamGenie Car Valeting Glasgow cover all of Glasgow, surrounding areas and Glasgow City Center.